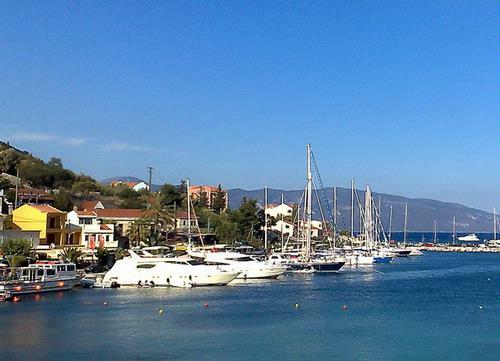 The picturesque port of Agia Efimia. Agia Efimia is another village which has recovered from the devastation of the 1953 earthquake. Modern Agia Efimia is a fishing village and a point of departure for passenger ferries to Ithaca as well as being capital of the Pilaros region of Kefalonia. The village takes its name from the church of Agia Efimia which is situated off the main road. The Saints day is 11th July when celebrations and a parade take place. The village offers bars, tavernas, a bank, post office, a pharmacy and various shops. As nearby Fiscardo becomes more popular (and expensive! ), Agia Efimia is becoming increasingly popular with the yachting fraternity. As such, the harbour is popular with the yachting fraternity whose boats fill the marina during the busiest months of the year. There are some secluded shingle coves on the road between Agia Efimia and Sami, the largest and most frequented is that of Agia Paraskevi. Most of the beaches in the region tend to be pebble rather than sand, which is ideal for snorkeling, though not so good for families with younger children or simply for those who want to stretch out in the sun. The magnificent Myrtos Beach is only a short drive away, however. During the summer, months the Municipality of Pylaros provide a regular bus service to and from Myrtos Beach, with the bus leaving from the harbour area. Timetables are posted outside the Tourist Information office. Check locally for full details.